A Cozy Vacation Rental Cabin with an Amazing View! Cute as a button! Bear Paw is nestled in the mountains of Cherry Log, GA, just 15 minutes from downtown Blue Ridge shopping and dining. Walk through the front door of Bear Paw and you'll instantly feel overtaken by the sweet southern atmosphere of the Blue Ridge mountains. Curl up to the fire downstairs and enjoy a movie or simply...some quiet time. With a well-equipped kitchen, whip up some mealtime favorites and enjoy them on the quaint dining room table that's the perfect size for two to four guests. In each bedroom, you'll be able to enjoy television as well as a tastefully decorated sitting area with views where you can have a seat and read or listen to the sounds of nature. In the upstairs bedroom, you may enjoy a nice soak in the jetted bathtub. 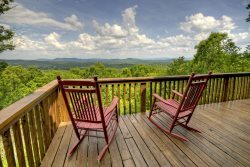 Walk outside to the deck and you'll be able to surround yourself with mountain views for an outdoor meal, or a visit to the hot tub where you'll find it's quite easy to relax in peace. Located in Cherry Log, just 15 minutes from downtown Blue Ridge shopping and dining. Property was in great condition, with a great view and a quick drive to downtown Blue Ridge. No complaints. Excellent service, and appreciated your calling to ask about my stay. The bear paw is really great home. Deck was wonderful. The team has always been wonderful to work with, this was my second time renting and already have a trip planned for November. Beautiful cabin with a wonderful view. Great decorating and clean as can be. Wonderful house cleaner as the cabin smelled awesome upon our arrival. We absolutely loved Southern Comfort Cabins, from the accommodations to the customer service. We absolutely loved Bear Paw!! The accommodations were great, the holiday decor really added a wonderful touch to our vacation, and the view was spectacular! The cabin was fully stocked with anything we would need, from plenty of towels to a crockpot! Thank you for an excellent vacation experience! Ray has assisted us on both recent visits. We have found him to be warm, knowledgeable and professional. Bear paw is a little slice of heaven for those looking for rest and relaxation and cool, mountain breezes. Property was ideal for a romantic getaway! The ladies at check-in were professional and explained directions to our property. They also explained things to do down town. Professional, easy to work with. We are looking forward to making this an annual trip! Very knowledgeable and experience team really enjoyed working with them! This was one of the most well equipped cabinets we have ever stayed in. We have stayed in cabins in the south east the last 10 to 13 years, this was the cleanest and most equipped (specially in the kitchen area) we have been in. We have used southern comfort cabin four times in the last year. really enjoy the service and quality of their cabins we've stayed in. We love the screen doors we had the capacity to enjoy the environment without the elements. My wife really enjoyed the wind chimes. Thanks for a wonderful stay will return soon! Each time I spoke to a member of southern comfort cabin rentals they were very kind and helpful. The cabin we choose was pet friendly. It was very clean, peaceful and met our every expectation. Can't wait to go again! We love this area! We travel Virginia, North Carolina,Tennessee and Georgia Mountains , renting different cabins. This was one of our favorite!